Robert Ripley has open his vault of the weird and wonderful again for new and absolutely unbelievable stories in the new Ripley’s Believe it or not. Filled with wacky and unexplainable stunts and facts, this book make you want to keep turning the pages to see what exactly people are capable of achieving. At time I had to re-read once or twice because I didn’t think it was possible for a 50-pound block of ice to fall out of the sky and crush a car for no reason. The book this year is smaller in size but still loaded with great content, but this is one of the books that will catch you with the front cover. Just seeing it made me want to read the book and find out exactly what kind of world awaited. 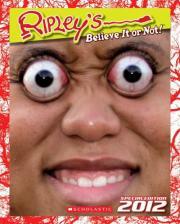 Ripley’s Believe it or Not is a great book and just goes to show how wonderfully weird and wacky our world really is.